The skeptics (those forced to study his work) and the jealous (those of us who figuratively sit at his feet bashing out epic fantasy novels on our laptops) dismiss J.R.R. Tolkien as a once-in-a-lifetime genius. We couldn’t emulate him even if we wanted to (though of course we do want to). We comfort ourselves that in today’s world of instant gratification, you cannot spend several pages describing a forest, however old and steeped in magic it may be. I have read a number of books about the master and even began a fictionalized account of his life. I have on my iPod a course from the iTunes University – The Tolkien Professor by Corey Olsen, a professor himself from Washington College. I want to share a few tips that Tolkien had for writers. This is taken from a post by Roger Colby, an author and English teacher. Mr. Colby never met Tolkien, though thanks to photoshop, he looks like he might have! Judging by his research, he deserved to! Mr. Colby spent a month carefully dissecting ‘The Letters of J.R.R. Tolkien’, edited by Humphrey Carpenter, and underlined every instance where the master of Middle Earth wrote about his process. The quotes are attributed. Any comments belong to Mr. Colby, though I strongly recommend reading the entire article. “…I certainly hope to leave behind me the whole thing [LOTR] revised and in final form, for the world to throw into the waste-paper basket. All books come there in the end, in this world, anyway” (121). 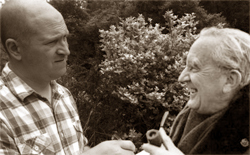 In another letter to Sir Stanley Unwin dated July 21, 1946, Tolkien lists a mound of personal struggles he was facing: being ill, being overworked and missing his son Christopher who was away in the Royal Navy. He put many of his struggles aside, though, and went to writing. He had to balance his day job with his desire to write epic stories set in Middle Earth. He found time. He made time. It took him 7 years to write The Hobbit. (117). The thing that he writes about most in this period is his struggle to get the work finished on his novels and to balance teaching and his many duties at Oxford College. Apparently he found a way. Tolkien writes to his editor about the comments C.S. 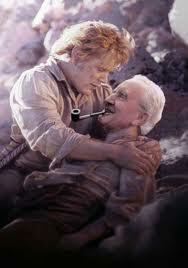 Lewis made about The Lord of the Rings: “When he would say, ‘You can do better than that. Better, Tolkien, please!’ I would try. I’d sit down and write the section over and over. He writes that he “cut out some passages of light-hearted hobbit conversation which he [Lewis] found tiresome, thinking that if he did most other readers (if any) would feel the same…to tell the truth he never really like hobbits very much, least of all Merry and Pippin. But a great number of readers do, and would like more than they have got” (376). Tolkien wrote: “I began the construction of languages in early boyhood: I am primarily a scientific philologist. My interests were, and remain, largely scientific. But I was also interested in traditional tales (especially those concerning dragons); and writing (not reading) verse and metrical devices. These things began to flow together when I was an undergraduate to the despair of my tutors and near-wrecking of my career” (345). He writes “The first version of the song of Strider concerning Luthien,… originally appeared in the Leeds University magazine, but the whole tale, as sketched by Aragorn, was written in a poem of great length” (346). Tolkien writes: “The Hobbit saw the light and made my connection with A. & U. by an accident.” Further: “From The Hobbit are also derived the matter of the Dwarves, Durin their prime ancestor, and Moria; and Elrond. Mr. Colby: “Sometimes accidents happen, and sometimes those accidents will lead a writer to a publisher or create an entire novel. Tolkien created entire worlds and then used what he knew of myth and legend to tell iconic, archetypal stories based in those magical places. Tolkien writes: “In sleep I had the dreadful dream of the ineluctable Wave, either coming out of the quiet sea, or coming in towering over the green inlands. It still occurs occasionally, though now exorcised by writing about it. It always ends by surrender, and I awake gasping out of the deep water. I used to draw it or write bad poems about it. When C.S. Lewis and I tossed up, and he was to write on space-travel and I on time-travel, I began an abortive book of time-travel of which the end was to be the presence of my hero in the drowning of Atlantis” (347). Tolkien: “There was a curious local character, an old man who used to go about sweeping gossip and weather-wisdom and such like. To amuse my boys I named him Gaffer Gamgee, and the name became part of family lore to fix on old chaps of the kind. At that time I was beginning on The Hobbit. The choice of Gamgee was primarily directed by alliteration; but I did not invent it. It was caught out of childhood memory, as a comic word or name. It was in fact the name when I was small (in Birmingham) for ‘cotton-wool’”(348). Tolkien relates the following story: “I lived for a while in a rather decayed road (aptly called Duchess) in Edgbaston, B’ham; it ran into a more decayed road called Beaufort. I mention this only because in Beaufort road was a house, occupied in its palmier days, by Mr. Shorthouse, a manufacturer of acids, of (I believe) Quaker connections. He, a mere amateur (like myself) with no status in the literary world, suddenly produced a long book, which was queer, exciting, and debatable – or seemed so then, few now find it possible to read. It slowly took on, and eventually became a best-seller, and the subject of public discussion from the Prime Minister downwards. This was John Inglesant. Mr. Shorthouse became very queer, and very UnBrummagem not to say UnEnglish. He seemed to fancy himself as a reincarnation of some renaissance Italian, and dressed the part” (348). Tolkien writes: “I now find The Lord of the Rings ‘good in parts”(349). Tribute: Given that I have relied heavily upon the research of Mr. Colby, I would like to promote his own novel as appreciation. The Transgression Box- Roger Colby. Dornin is known as the village liar…but he will also be their unwitting savior. It all begins when Dornin finds a mysterious object in the forest – a perfect cube of a box – and brings it back to his village. Unsure of its purpose, he hands over the object to the village elders – but during the night he spots a strange fog emanating from the House of Elders, and in the morning, over half of the people of the village have fallen into an unnatural and unending sleep. Dornin decides he must set off on a quest to destroy the “Transgression Box” in order to save his people. Along the way he will encounter many strange and dangerous places, as he desperately tries to destroy that which must be destroyed for him. The Transgression Box is an allegorical science fiction tale of faith, trust and hope. Alon Shalev is the author of The Accidental Activist and A Gardener’s Tale. He has written three epic fantasy novels and the first reached the Quarter Finals of the Amazon Breakthrough Novel Award as of March 2012. More on Alon Shalev at http://www.alonshalev.com and on Twitter (@elfwriter). This entry was posted in Other Authors and tagged Aragorn, Atlantis, Beaufort, Birmingham, C.S. Lewis, Corey Olsen, Dornin, Durin, dwarves, Edgbaston, Elrond, epic fantasy, Gaffer Gamgee, Gandalf, hobbit, Humphrey Carpenter, iPod, Isengard, iTunes University, J.R.R. Tolkien, Leeds University, Lord of the Rings, LOTR, Luthien, Merry, Middle Earth, Moria, Mr. Colby, Mr. Shorthouse, Oxford College, philologist, photoshop, Pippin, Prime Minister, professor, Quaker, Roger Colby, Royal Navy, Saruman, Sir Stanley Unwin, Strider, The Hobbit, The Letters of J.R.R. Tolkien’, The Tolkien Professor, The Transgression Box, Washington College, wizard. Tips J.R.R. 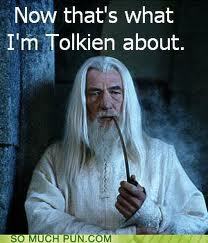 Tolkien left for the writers who would follow. I love Tolkien, and I have sat down and read the entire book (books). It took me two months because I savored the story, fantastic! He was a master and I appreciate his imagination! The other I love is George R R Martin. I love his Fire and Ice series and I am patiently waiting for book 6. I am also writing a fantasy series and it has taken me (so far) 3 and a half years to complete the first book. 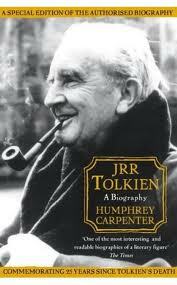 I am at the end of the re-write and although I know it will never be as good as Tolkien, he is my inspiration. Thanks for this post and I will check out your books! Oh, how I love LOTR… My daughter and I both recently ran out of new things to read and independently started reading LOTR on our Kindles. I’ve never tried writing epic fantasy, although I love the Chronicles of Narnia, too. What great worlds are Middle Earth and Narnia! Great post. Love the story toward the end of the little know guy who manufactured acids and came out with a bestseller one day. Shows that anyone can make it, although sometimes it can be perplexing. But who doesn’t love Tolkien? Reading his work as a child is what makes me want to write fantasy.